A virtual magazine for a true passion! Click on a picture to see an enlargement! In 1938 Bugatti set up a special design office in the rue de Debarcadere in Paris, to design and build an airplane. 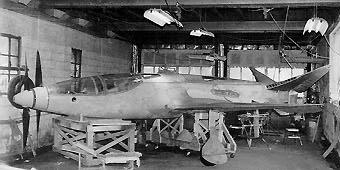 It was to be a high-speed fighter, but the first aim was to enter in the Coupe Deutsch, a special race for planes. The Pilot was to be Maurice Arnoux, who was lost in air combat in 1940. Click on a picture to see an enlargement! 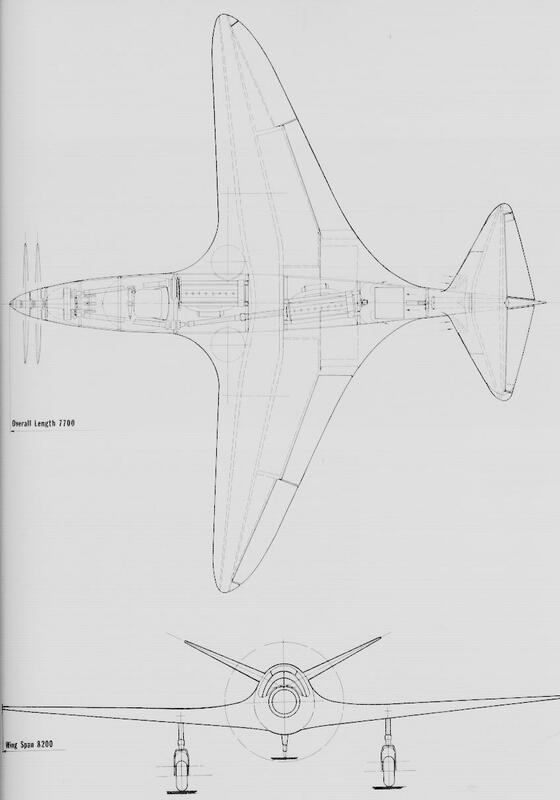 As one can see the design was very advanced, with an inverted Y-tail, the wings pointed forward (still modern today!) and powered by two type 50B (supercharged) racer engines of about 400HP each. 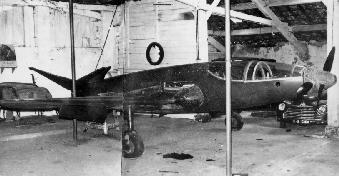 These were mounted one behind the other behind the pilot, and drove through long shafts on either side of the cockpit, and a connecting gear, a double, counter-rotating propellor. Is it a coincidence that the same principle was found on the Breguet Leviathan? 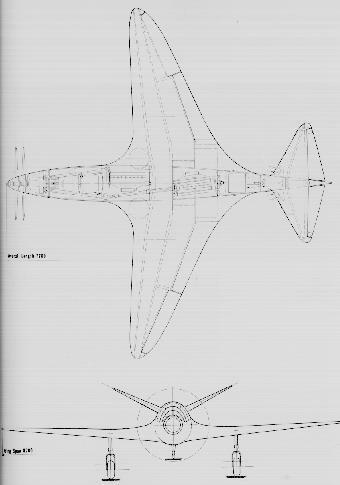 The radiator, set behind the engines, was cooled by air entering at the leading edge of the tail wings, and flowed forward through the radiator. The Fuselage and aerodynamics were designed by Louis de Monge. The denomination 100P stands for the first version, 110P is the second with a decreased wing span (6.7m, originally 8.2 m) . 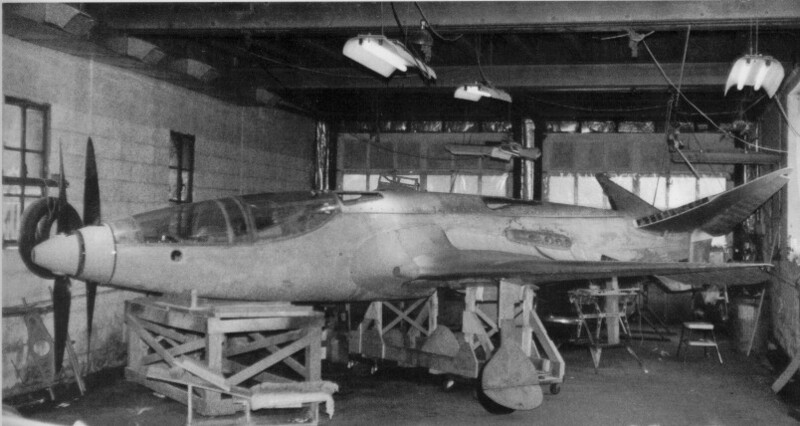 This was actually a modification of the first, so only one was built! The fuselage was made of balsa wood blocks which were then shaped to get the contours needed. The plane was not completed in time for the war, was hidden and somehow managed to survive it. Tragatsch states that it is very strange, that the French government did not really help Bugatti with the development of this brilliant plane, as of course there was a great need for fighter planes!. The mystery gets even stranger when one knows that the French government paid 5.3 million Francs (source: Chadeau) to install Bugatti in Bordeaux at the beginning of WWII! What did Ettore Bugatti do for the French government in the war?? Sometime after the war the plane was shipped to the USA, and the engines were removed for use in racecars (but where are these?? There are not so many T50B engined cars around!). Very recently the aircraft was donated to the EAA Air Adventure Museum in Oshkosh, Wisconsin, where the Bugatti Airplane now is at display. It arrived there in July this year! The Bugatti will be on display, and the museum is open from Mo-Sa 8:30 - 17:00, Su 11:00 - 17:00. It is located off Highway 41 at the Highway 44 exit in Oshkosh. Info: (414) 426-4818. A model of the 100P, to really enjoy her beauty! Hopefully she will one day be fitted with the engines and fly! 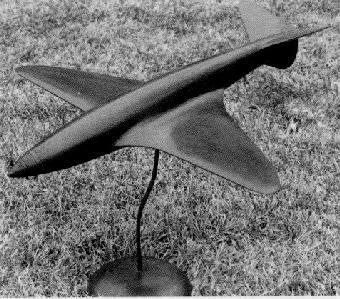 That the design can fly was shown by enthusiast Robert Nelson, who build a model in 1978, that actually flew! You can still see the engineering that went into this plane used till this day. Read on about this aircraft in the next issue of the Bugatti revue ! Become a member of the Bugatti Aircraft Association!